A Colorado Hunter's Life: You called in a what? November 18, 2013 - Day one of my second season in my Mountain Lion hunting saga. The plans for the morning had revolved around the possibility of snowfall. Snowfall represents the best tracking conditions to possibly find a Mountain Lion. However, snow had been removed from the forecast and a long morning of scouting, with possible calling in the afternoon, was planned. Shortly after 8:00 am my father and I headed for the high country in what has been referred to as “the battle wagon,” to some, and “Elvira” to others. 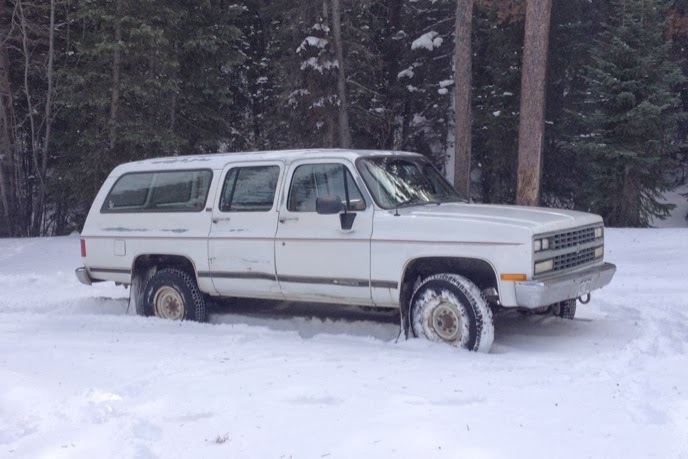 Elvira is a 1991 Chevrolet ¾ ton V2500 Suburban. She is a tough old rig in perfect working order. The body; however, leaves less to be desired: peeling paint, dents from other adventures, and a spot or two of rust is readily apparent. I am convinced that you could contract tetanus just from looking at her. I should not be so negative; she has never failed to bring me home and did not let me down today. As we neared the high country I found that the forecasters had been correct, they had just chosen the wrong elevation. 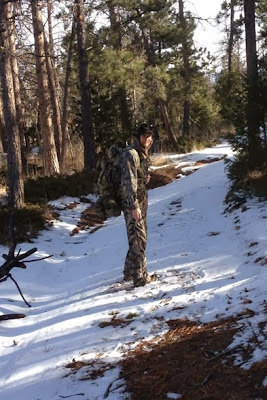 There was plenty of snow to be found in the high mountain areas where I hunt for Lions. My plan for the morning was to spend time scouting a few prospective call stand locations. However, this was quickly changed to driving every forest road possible in an attempt to find the tracks of a Lion. Four hours later we had located nearly every track there was to be seen in the Colorado Mountains...except Lion. We found tracks for fox, coyote, elk, deer, moose, rabbit, squirrel, and even the occasional bobcat. I found one set of bobcat tracks directly adjacent to a set of grouse tracks. It made me wonder if the grouse was now still among the living. Eventually we ran out of passable roads as the snow deepened. I could have put Elvira in her favorite mud chains; however, I had to perform a time cost analysis: spend 20 minutes putting on the chains, and another 10 min to remove them, only to plow through a few more miles in higher country where my hunting theory doesn’t seem to apply. My theory is that as the snow accumulates in the high mountains, the deer move lower, and the predators follow. I decided this was the end of our road running for the day and turned toward my closest call stands at lower elevations. I went to a new stand that I researched on google earth and forest maps. While this is beneficial, I always seem to underestimate the terrain. I look at a location and get excited, thinking, “it’s not that far”, or “that hill is not that steep.” Of course when I actually arrive in person I find the Grand Canyon, but always trek through anyway. Last year I found a Lion track headed into a large valley. The valley floor was on private land, but I could access one side of the valley on one ridge that was part of the National Forest. Everything looked prime for lion country. Deer were known to be it the area, and there was plenty of cover and rocks for the lions to perch in. I had previously spoken to a trapper who suggested this location as a place he had seen cats in before. This ridge top was where I chose for my first lion stand of the day. We set up on a rock outcropping with a clear view into the valley. Despite the research, an hour worth of calling yielded a few Magpies and nothing more. This location still held potential to me. It is a simple fact that if there are no lions to hear my calls in this area today, it doesn’t mean they will not be there tomorrow. Headed toward the valley call stand. At the conclusion of the call stand, we quickly packed up and drove to the day’s last setup. This area is at the top of a large valley on a ridgeline that is full of rock formations. On the other side of the ridgeline lies a second valley, which is often inhabited by deer. Several years prior I had stumbled upon a lion on this very ridgeline. The encounter was brief and I believe we left each other equally startled. I set up and settled in for a 70 minute calling session, all that was left of legal hunting hours. After calling for approximately 10 minutes I caught movement below me. I slowly moved to prepare for a possible shot and waited to see what I had called in. There was a tree about 60 yards away and I saw something step around the side of the trunk. I was expecting the tawny fur of a lion, or a slinking bobcat. Instantly my brain registered the size, shape, and color were entirely inconsistent with my quarry; however, I was very familiar with this specific species. This particular animal was in fact an adult Mule Deer Doe. This seemed very odd to me at first. My predator hunting mindset had not caught up with the simple reality of what I was doing. I was using a fawn in distress call, and it was working very well, just not for the intended audience. Two fawns, a mature buck, and another doe quickly joined the first doe. I spent the next 60 minutes trying to call the deer as close as a possible. In the end I was able to get them as close as 40 yards. I was entertained, and at the same time hopeful that I might witness a lion kill on my very real decoys I had just acquired. At the end daylight faded and I was forced to reveal to the deer what I really was, there was an odd satisfaction to have fooled them for so long. As we headed for home, I thought about the day. It was a rare opportunity for my father and I to hunt together. I cherish any time we can spend together away from the electronic strings of our jobs. The lions won week one, but the game is long and I am patient. The chase is what I enjoy the most.